"The Audioengine 5+ (A5+) active speakers deliver audiophile-quality sound and features at a price that continues to set the standard for affordable high-quality audio. Connect your iDevice, computer, TV, or any other audio component for great stereo sound. The goal of Audioengine is to give our customers a high-end listening experience at affordable prices with easy to use, high-quality products. 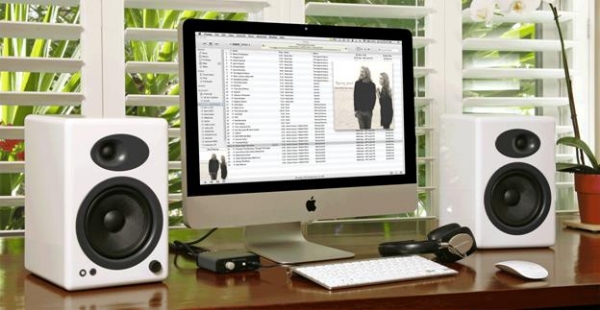 The Audioengine 5 powered speaker system was Audioengine's flagship model and has become a best seller, winning numerous awards along the way. The new A5+ incorporates the same award-winning design as the original A5 but includes customer-requested upgrades and features." Bar none, Audioengine makes the best speakers I've heard at any similar price point. They simply sound incredible - I reviewed the original A5's back in 2007, and they still sound as good today as they did back then (actually, even better since I bought an Audioengine S8 subwoofer and added it to the mix). With the built-in 3.5mm input jack, they make a great accessory for smartphones, MP3 players, laptops, tablets, etc. I love the sound of AudioEngine speakers so much I have three pairs of their smaller A2 units in my home office. You get the point. :-) AudioEngine's release of the new A5+ speakers brings with it a $50 price increase, making them a pricey accessory at $399, but a set of speakers like this will last for years, through multiple computer upgrades. What's new about the A5+ over the previous A5's? To quote Audioengine, "advance tuned cabinet with rear-ported waveguide, improved thermal management, upgraded speaker connector binding posts,remote control, variable preamp line out, RCA and mini-jack inputs, and new stand-mount 1/4" threaded inserts". I don't see anything in that list that would make me want to replace my A5's, but if I buy another set of speakers, I'll take a serious look at the A5+ speakers.